Latest technology Hypersport Radials designed and developed to get the best out of the latest Hypersport machines. Application: Ultra high performance sport. Dual-compound front tire (3LC) with revised profile generates higher grip at lower lean angles. Triple compound tear tire (5LC) with revised profile provides improved stability and durability. 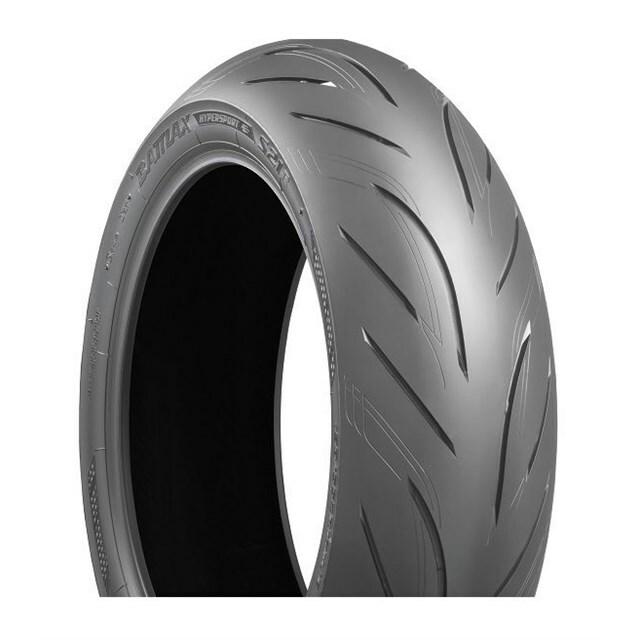 Compares to: Dunlop Q3, Michelin Pilot power 3, Pirelli Diablo Rosso 3, Metzeler Sportec M7RR. Mono Spiral Belt - Mono Spiral Belt (MSB) construction means that a continuous single strand is wrapped around the circumference of the tire. This one-piece construction eliminates overlapping of belts, seams and joints. A MSB tire is lighter than conventional multi-cross belt construction. It has more stability since it minimizes heat generation inside the tire and provides high bump absorption. Lighter, better straightaway stability, and better shock absorption than cross belt construction. HTSPC - High Tensile Super Penetrated Cord - Bridgestone is the first motorcycle tire manufacturer to utilize multi-filament rubber insulated steel (MS.Belt) in the manufacture of its motorcycle radial tires. This technology offers many advantages over steel that is used by the competition. This makes the tire more flexible, provides more stability without a reduction in bump absorption, and minimizes the generation of heat throughout the tire. 3LC (Dual Compound) - 3LC offers ideal grip performance demanded in every aspect and all riding modes. The center compound offers linear handling. The shoulder compound secures high grip and solid contact feeling. 5LC (Triple Compound) - 5LC offers ideal grip performance demanded in every riding mode and aspect. The center compound offers good stability. The shoulder compound transfers the engine power to the road with strong traction. The edge compound offers strong side grip and solid contact feeling in deep lean angles. RC Polymer - RC Polymer technology optimizes the distribution of silica within the rubber compound and improves tread flexibility allowing greater contact with the road surface in both hot and cold conditions. The reduction in molecular friction also improves rolling resistance, therefore increasing fuel economy. Silica Rich EX - Wet performance is improved by greatly increasing the amount of silica compared to conventional SILICA RICH. NanoPro-Tech - NanoPro-Tech is the name of a technology that facilitates the realization of the required features in a tire by controlling the material microstructure through structural design at the molecular level. It is one of Bridgestone's fundamental technologies.